Its critical value is set to 13 damage, equal to its base damage. While still fairly weak at higher levels when you're likely to obtain it, it's better than most, as most bows only offer half of their base damage in critical damage. 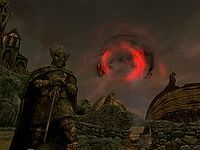 Be wary about shooting the sun with Sunhallowed arrows in a populated area (such as Whiterun) as townspeople will likely be hit by the rays which shoot forth. You can obtain Bloodcursed elven arrows from Serana after Touching the Sky. Simply speak to her and select the dialogue option. 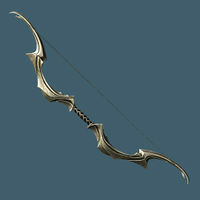 Note that your own elven arrows must be used to create their Bloodcursed version. Bloodcursed elven arrows cannot be obtained if you have convinced Serana to cure herself of vampirism. If you ask Valerica to make Bloodcursed arrows she will politely refuse and say that she never wanted any part in the prophecy. Blotting out the sun will sometimes cause vampires to attack a city and many NPCs will make comments about the sky. If you blot out the sun, Sunhallowed arrows won't work until the next day. When you point at the sun with Auriel's Bow drawn and Bloodcursed or Sunhallowed arrows equipped, the screen will briefly tint red or yellow, respectively. This can help you aim at the sun even behind mountains or cloud cover. If you blot out the sun, reading either the Elder Scroll (Sun) or Elder Scroll (Blood) will return the sun to normal and allow you to use the Sunhallowed arrows without having to wait a full day. Sunhallowed arrows shot at enemies will cause explosions when using Auriel's Bow. While Auriel's Bow also appears in Arena and Daggerfall as a powerful enchanted weapon, in Morrowind this artifact is unenchanted. If the bow is given to Harkon before you battle him, it can be retrieved from his ashes when you defeat him along with other rare items. Anything that forces a weather change will appear to end the darkened sun effect prematurely, such as Clear Skies. The returned sun will have a red tint to it, vampires will not take sun damage, and NPCs will react as though the sun was still darkened until the next day. The Sun Damage enchantment is bugged. The damage is split into two parts: a 1-point component that affects all creatures, and a 50-point component that only affects the undead. Unlike other Sun Damage effects, the one used by Auriel's Bow isn't in the Restoration school, so Restoration skill and Fortify Restoration effects don't enhance it as expected. If Auriel's Bow is in your inventory when you're arrested during The Forsworn Conspiracy, the bow will be lost and will not be returned at the end of the quest. The bow should be recoverable in the evidence chest inside the prison. Shooting Sunhallowed arrows at the sun may cause it to become dark like the bloodcursed arrows. ? Esta página foi modificada pela última vez à(s) 16h06min de 1 de novembro de 2015.